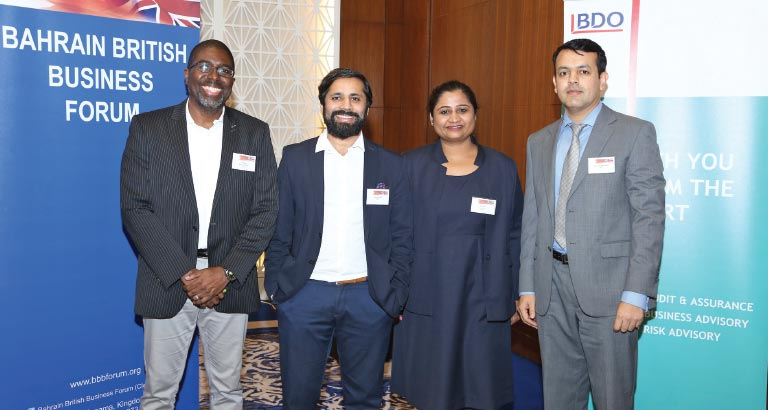 In advance of the imposition of VAT in the Kingdom, the Bahrain British Business Forum (BBBF) and expert consultancy, BDO, hosted a meeting to discuss the issue featuring BDO Bahrain’s VAT specialists, Smita Roy, BDO partner (Leader VAT), and Marlon Appleton, BDO senior manager (VAT), as the guest speakers. More than 130 BBBF members heard their presentation which offered the latest information from the Ministry of Finance about the implementation of VAT in Bahrain. The presenters also shared their collective experience from the implementation and practice of VAT in Saudi Arabia, the UAE and the UK. “To avoid many of the pitfalls experienced by businesses in Saudi Arabia and the UAE, it is important for businesses to have an action plan for VAT readiness to ensure a smooth transition to VAT. The readiness measures should be effectively deployed to avoid last-minute chaos,” added Marlon Appleton.